There are a lot of things that can go wrong when you’re potty training a child. This should not be one of them. 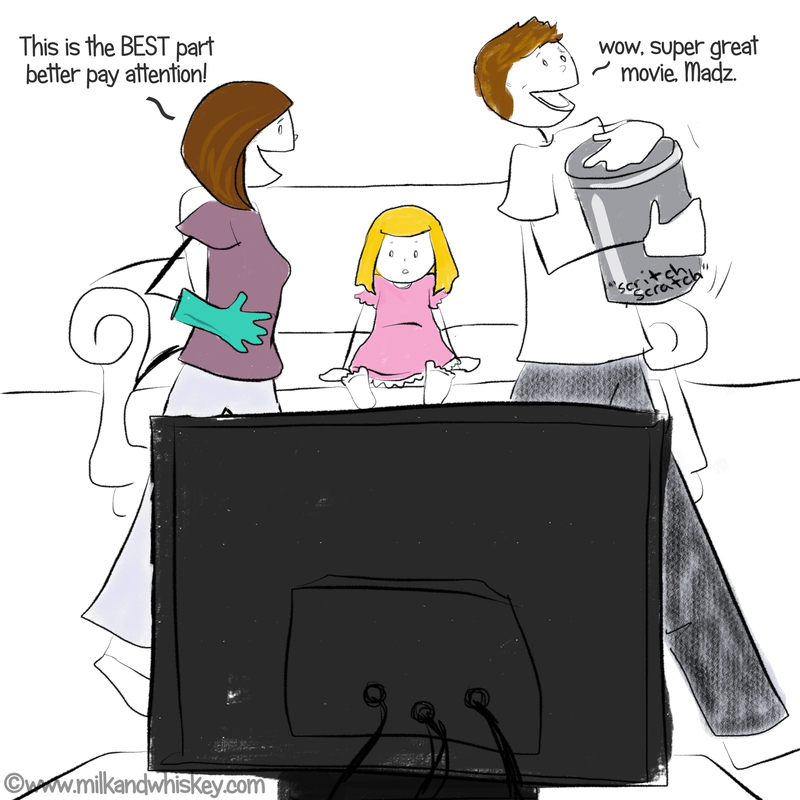 Let me lay some scene on you: It was “popcorn & movie night” at the M.I.L.K household, an extra special treat we have when mom can’t handle cooking dinner – basically every Friday. We were all snuggled on the couch under piles of fleece blankets, mom and dad trying to feign interest in the Madness’s movie choice, numbing our frontal lobes with gin. It was winter in Washington so, even though it was early, the world and the house were already Halloween dark, save for the glow of the screen and our smart phones. I get up to pee. Husband and the Madness sit entranced by whatever princess nightmare Disney has whipped up for us. Well, she’s entranced. I’m pretty sure he’s playing online poker. Family time. “No, no,” I say, “don’t pause it.” Please, God, just let it end sooner. I stumble into the familiar darkness, my feet finding abandoned legos and various other toddler traps on the way to the john. As I near the restroom, I hear a funny drippy splashy sound that makes my stomach drop. I don’t want to open the bathroom door. If everything is flooding, I don’t even want to know. But I do open the door, cuz I have to race like a piss-horse, and flip on the light. The sound gets louder, but there’s no leak to be seen. Maybe the toilet’s just running, I think. The sound is different than that, but still familiar in a way I can’t quite put my finger on. I flip up the lid. I start to scream but, even in that moment of total panic, I know I can’t, not with Madz in the other room. I just let out this horrible little whining keel sound as I slam down the lid and dance around spastically like there are rats crawling up my shirt. I can still hear it swimming round and round. Splish splish. It’s trying to claw it’s way out. The lid of the toilet twitches and I jump a foot straight up. I slam the garbage can on the toilet lid and then walk VERY CALMLY out into the living room. He looks at me like I’m speaking Farsi, so I repeat myself, trying to communicate the seriousness of the situation with only my extra-crazy eyes, smiling beatifically (read: like a psychopath) the whole time. Madz had just started using the big girl potty and she could NEVER find out about this. EVER. He follows me into the bathroom asking me if I’m sure. Seriously. Am I sure?? I let him go in first. He takes the garbage can off the lid and rolls his eyes at me. The lid jumps. So does he. Who’s crazy now, huh? He peeks under the lid, slams it back down and puts the garbage can back in place. We both freeze and listen for Madz. Nothing. “But how did it get it there? ?” He’s obsessed with the how and why. He asks like eight more times. As if it’s pertinent. He holds the trash. I flip open the lid and bite back a scream as I half prod, half scoop Ben into it. We hustle him past the Madness, big smiles on our faces, and release him into the wild. Which is to say the alley behind our house. “Run free, Ben,” I call into the night, worried about him all wet in the dropping temperatures. “And please stay the hell out of our plumbing,” adds Husband. I throw the tongs away. We go back in. We sit next to Madz and eat popcorn with shaking hands (after washing them, like, a thousand times). All I can think is, what if it was her? What if our potty training two year old had been the one to pop up and run to the potty all, “I can do it myself, mommy!” only to find a terrified, scrambling rat flopping around in there. Lifelong constipation. I mean, I don’t even think our very good health insurance would cover THOSE therapy bills. Still, I tell you what, it was a long time before I could take a blind piss at 3am without doing a lights-on rat check. Not to freak you out or anything, but I suggest you do the same. Posted in Caution, Parenting in Progress, F'ing Everett, M.I.L.K. I can’t stop laughing, thank you for this post!! OMG this happened to me. But instead of a rat it was a squirrel and instead of the waking hours it was at 3 AM. 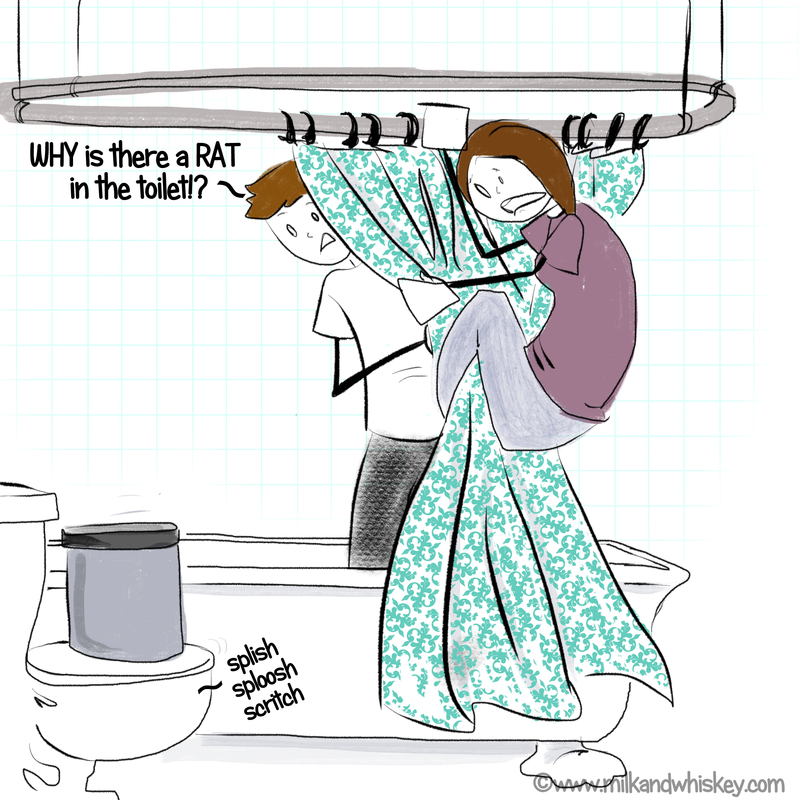 Let me give you a visual…I thought I had a rat in the house (not my husband) but the kind that walk on 4 legs. 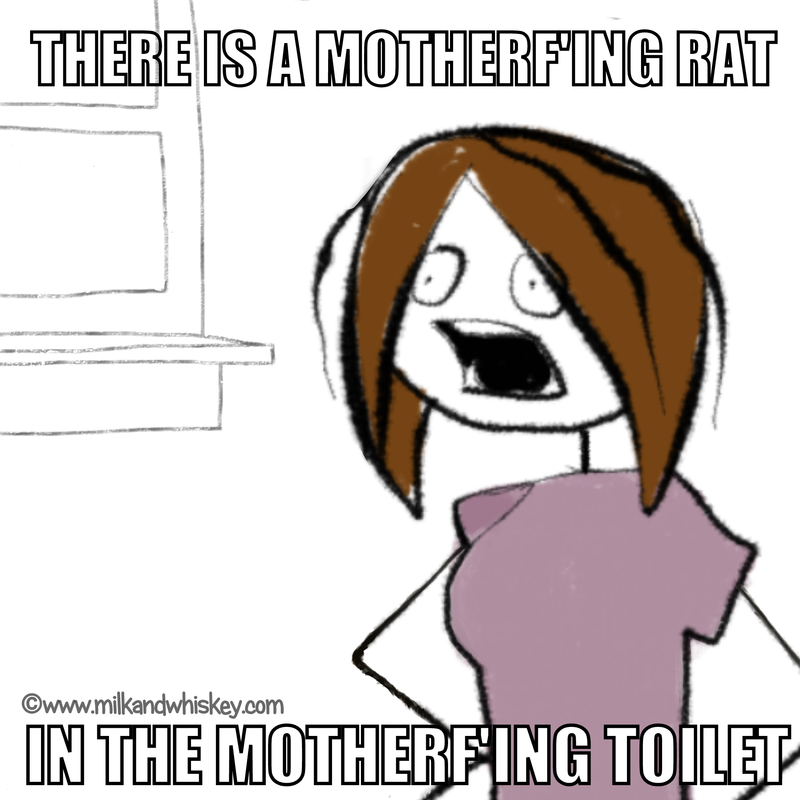 Called the exterminator who came running over with poison to make the rat get really really thirst and the plan was for that said rat to seek the outdoors for a delicious beverage but instead….At 3 AM I thought I heard one of kids get up to use the toilet (the sound of water running) but the water kept running longer then I thought was safe. Got up and discovered something furry thrashing about in the toilet, trying hard not to scream and waking up kids for a nightmare they would never wake up from I too threw the lid down….And waited for that thing to drown. By 5 AM called my soon to be ex-husband and promised him I would stop calling his girlfriend The Whore from Baltimore if he would come over and get that beast out of the kids toilet before they woke up! A win-win! I’m just sorry you had to come up with a new nickname for the girlfriend. Yes, yes…but we all have difficult challenges in our lives! AHAHAHAHAAAA omg I’m dying… also I am extremely impressed at your presence of mind at keeping it under wraps – it wouldn’t have even occurred to me to prevent my toilet training toddler seeing a huge rat doing backstroke in the loo. One of my most favourite posts ever ever ever. considering the zoo of animals apparently living in and around your house, Michelle, I bet your kids wouldn’t even flinch! That snake in your last post was gorgeous, by the way.